SantaTrackers.net – Be more than an elf. Track Santa for Santa. 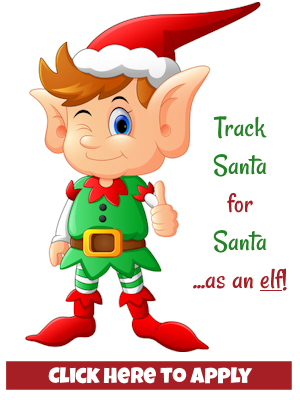 Thank you for your interest in SantaTrackers.net — where you can help Santa track Santa. You see, even Santa needs Santa Trackers. He needs YOU! Yes, the world has a lot of Santa tracking venues. But if you want to know really where Santa is AND what he’s up to you get it from the North Pole Tracking Department. That is who runs this website. If you apply and are accepted you will be employed this Christmas as an elf tracking Santa for Santa. It is a big job with lots of responsibility. It is a lot of fun, too. You will be employed to be Santa’s eyes and ears on the ground. You’ll be doing roof inspections, weather reports, surveying for sleigh landing sites and watching the skies for sleigh activity. In fact, there are dozens of elf functions you’ll be trained in between now and Christmas. It is a much bigger job than most know. You will also be asked to recruit other trackers. You see, Santa needs them every where — even if they live on the same street! The more eyes the better! By the time Christmas Eve gets here you will be one busy elf. Most elves are when they work for Santa. But don’t worry — we have it all mapped out for you. You just need to get on board, get trained and get to work in the elf business. Please CLICK HERE to be one of the first to apply to be a Santa Tracker this Christmas.